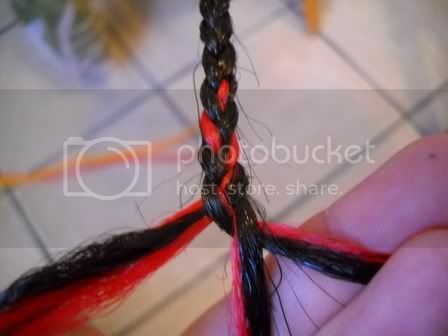 Start with a section of hair to start the braid. Mount on whatever is good for you, I use plastic hangars. 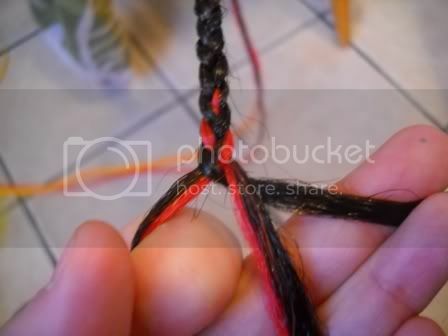 Braid the 3 sections until there is about 3 to 4" of hair left. 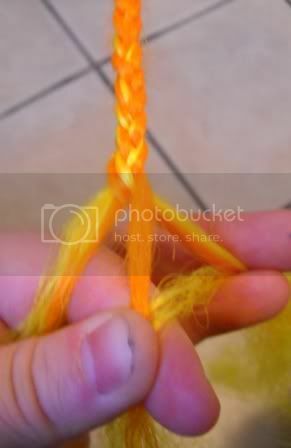 Before you can add on, you need to get to a part in the braid that looks like this. 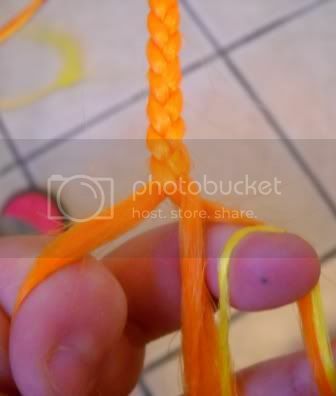 You have to be at the point where you are about to fold the left section over the middle section. 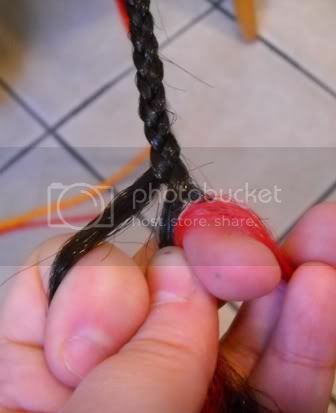 Now take a section of hair 1/2 the size of one braid strand or smaller. 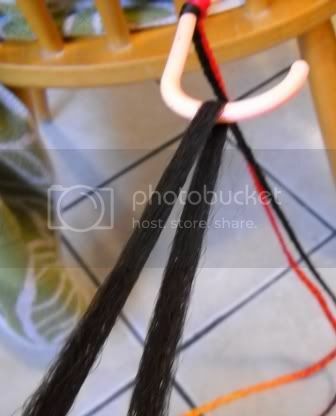 The smaller the add on hair, the better it's going to blend. 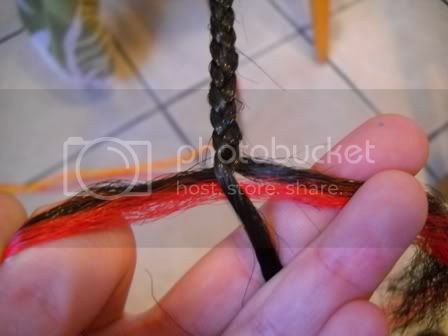 If the add on section is too thick, there will be lumps and uneven parts in the braid. It won't taper, either. 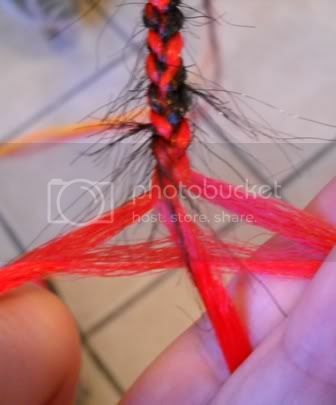 Find the center of the add on strand and place it as close to the braid as you can between the middle and right sections of the braid. 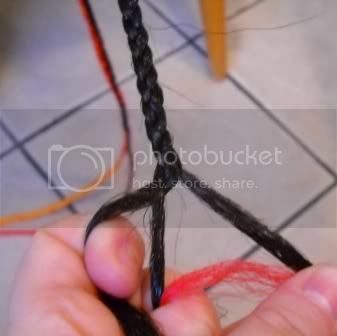 Hold one end of the add on with the middle braid section, and the other add on end with the right braid section. 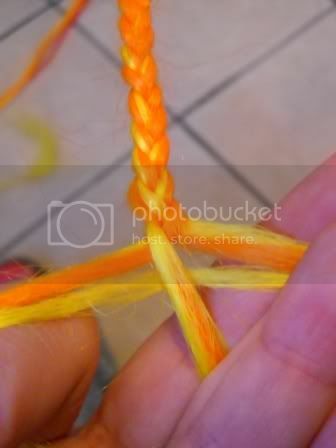 Fold the left braid section over the middle section. 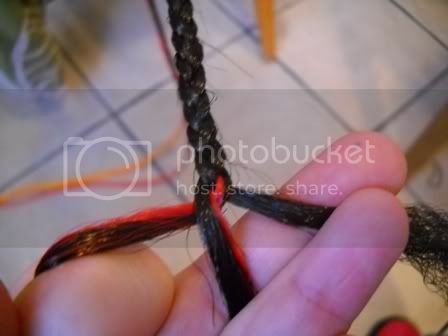 Fold the right braid section over the middle braid section. 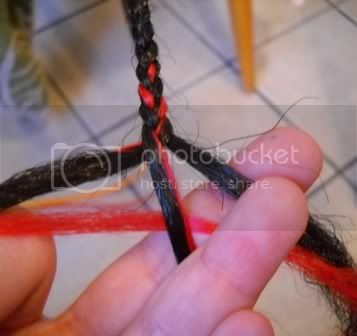 Fold left over right, and then the add on is attached to your braid. 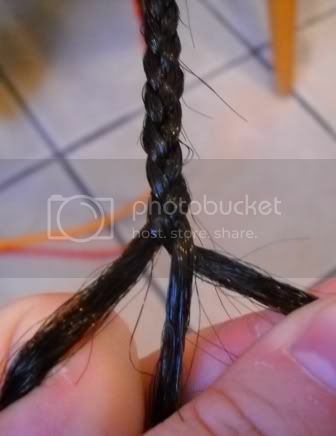 Keep braiding and adding on thin sections of hair, and keeping the thickness equal on the braid sections. 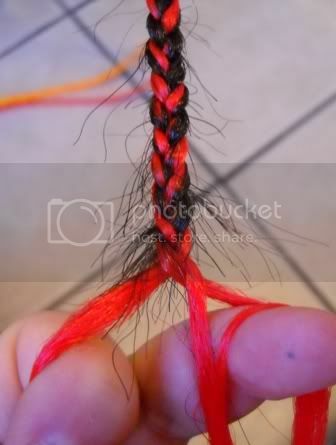 Don't worry about the frays, you can trim those off later. 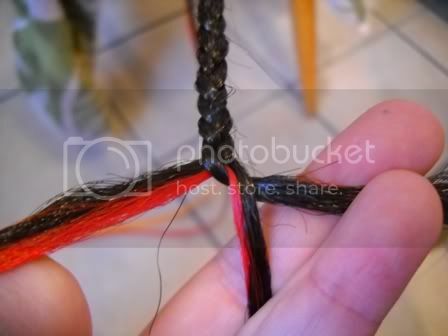 If you are doing transitional colors, be sure to add the same color to an area to keep the braid thickness uniform. 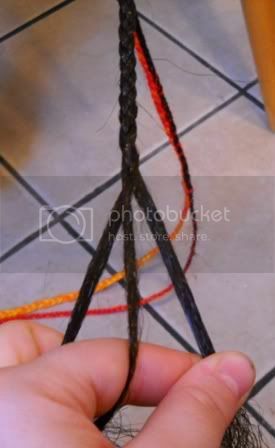 For transitionals or solids, braid until there is 3 to 4" of hair left, and start adding on again. 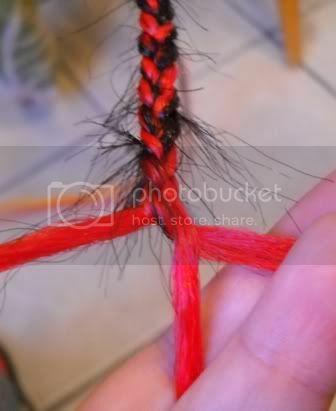 You can do this to make the braid however long you'd like. 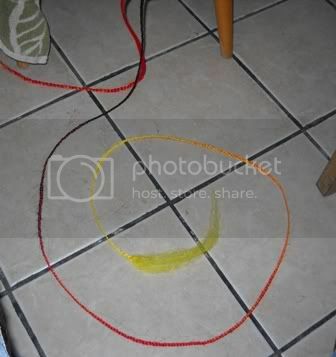 The rest of the pictures show going from red to orange to yellow. 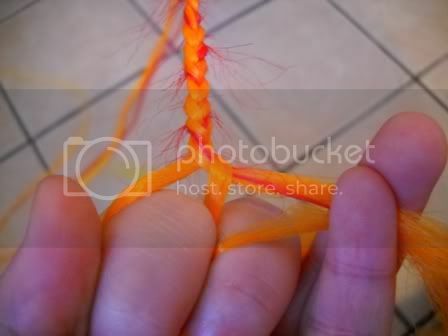 This braid ended up being 7 1/2 ft long. 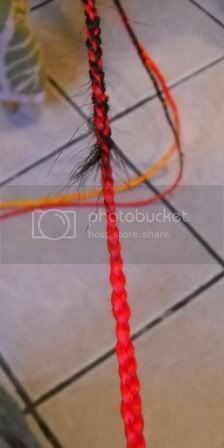 And there they are, really long braids! 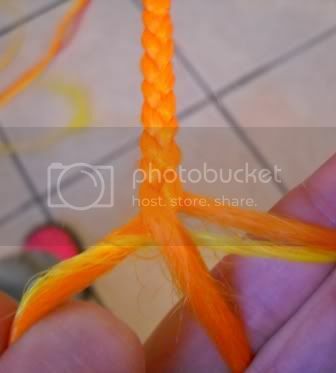 this tutorial is really, really awesome! ah thank you very very much! I always wanted to be someone. But only now do I realise...I should've been more specific . Very useful, great tut, thanks! Thanks everyone. This tut was a pain. 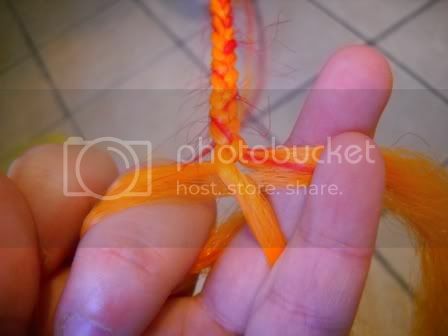 I was essentially doing all of this one handed while trying to work the camera one handed. So, please excuse the akward positioning of my fingers and such. 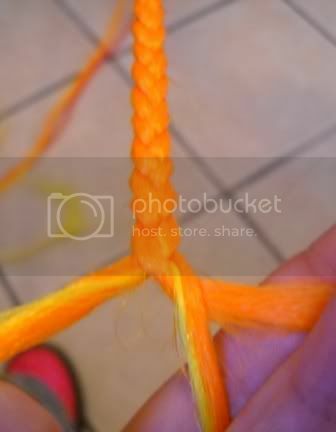 It should be alot easier than it looks in the pics due to the capabilities of two hands. Very cool. I'm glad you posted this. 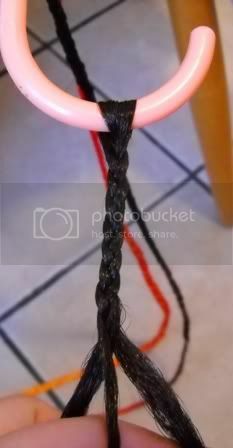 I have some bril ideas for halloween now! 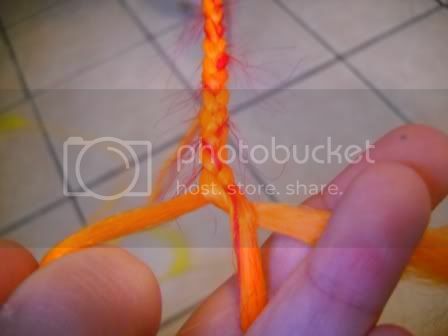 Thank you so much for posting this excellent tut! 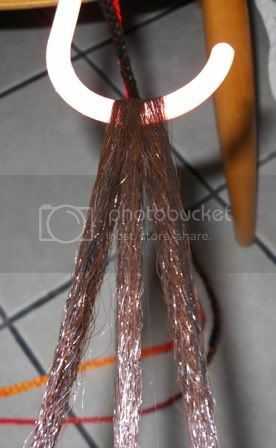 http://www.Cyberloxshop.co.uk - Hair supplies & Cyberlox galore! Facebook: http://www.facebook.com/cyberloxshop - come say hi! 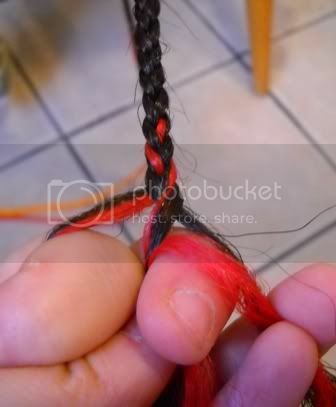 We love fake hair, bright colours and everything cyber! Oh and, lots of creating!